RA is a chronic autoimmune disease that affects 2.9 million patients (of which approximately 1.5 million are being treated with biologics) in the U.S. and Europe. RA is characterized by inflammation and degeneration of the joints. Patients suffer from pain, stiffness, and restricted mobility due to a persistent inflammation of multiple joints, ultimately resulting in irreversible damage of the joint cartilage and bone. According to GlobalData, sales of RA therapeutics across the 10 main healthcare markets was USD 19.5 billion in 2015, with the current market being dominated by injectable, biological therapies. Biologics, mostly TNF therapies, need to be injected and often lose their effect over time, so there continues to be a considerable unmet need with regard to efficacy, safety, and convenience of use with existing treatments. New oral therapies that target the Janus kinase, or JAK, signalling pathway are emerging to treat inflammatory diseases; JAK inhibitors, however, are associated with a range of side effects, including aberrations in low-density lipoprotein, or LDL, cholesterol and red blood and NK cell counts. Filgotinib, however, as so far not shown any of these side effects in Phase 2 clinical trials. 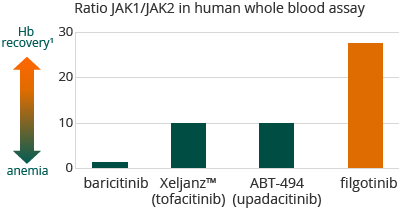 In a human whole blood assay we demonstrated that filgotinib, with a 30-fold selectivity for JAK1 over JAK2, was more selective for JAK1 than any other compound known to us to be either approved for sale or in clinical development. 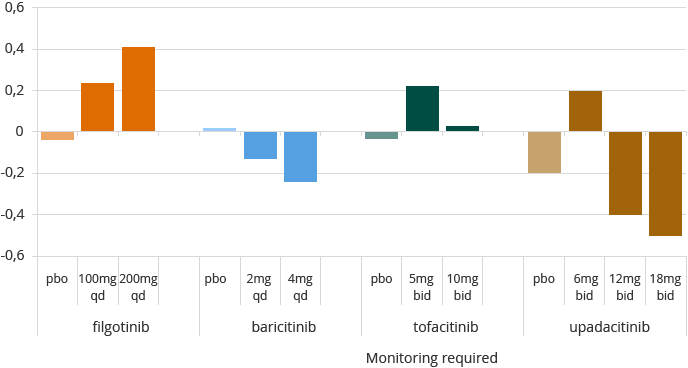 We believe the high selectivity of filgotinib for JAK1 over JAK2 and JAK3, may allow for a positive efficacy profile, with an improved safety profile. Clinical trials to date have shown that filgotinib is well-tolerated, with atherogenic index improvement and absence of anemia, and shows strong activity in treating RA. On top of this, we believe its once-a-day oral dosage and its low risk for drug-drug interactions make it convenient for patient use. Overall, there was no statistically relevant difference between the once-daily and twice-daily dosing regimens in DARWIN 1. Both trials showed a rapid onset of activity, as of week one for ACR and DAS28(CRP) responses. 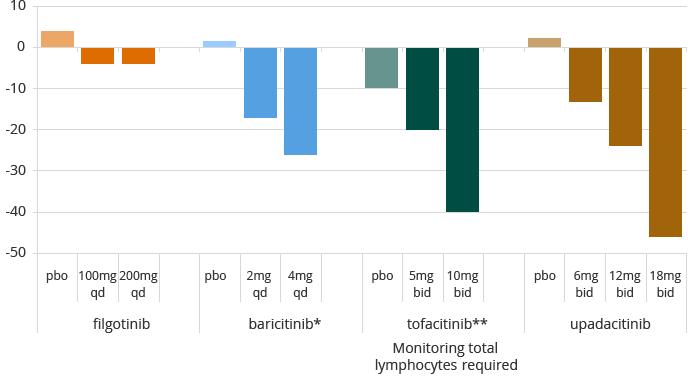 In DARWIN 1 (200 mg bid) and in DARWIN 2 (100 mg qd) up to 50% of the patients reached low disease activity or remission. The 100 mg and 200 mg qd doses achieved similar levels of activity overall. Safety data in both trials was similarly promising. In dose groups including placebo in both studies, 3.9% of patients stopped treatment during the trial for safety reasons. In DARWIN 1 patients reporting serious (2.5% overall) and non-serious treatment-emergent adverse events were evenly spread over the dose groups including placebo. Serious infections were reported in six patients, including one death on active treatment in the second half of the trial and for which the Data Safety Monitoring Board did not see a reason to pause or change the trial. No opportunistic infections were reported. Herpes zoster infection occurred in five patients, equally spread over placebo and filgotinib groups. 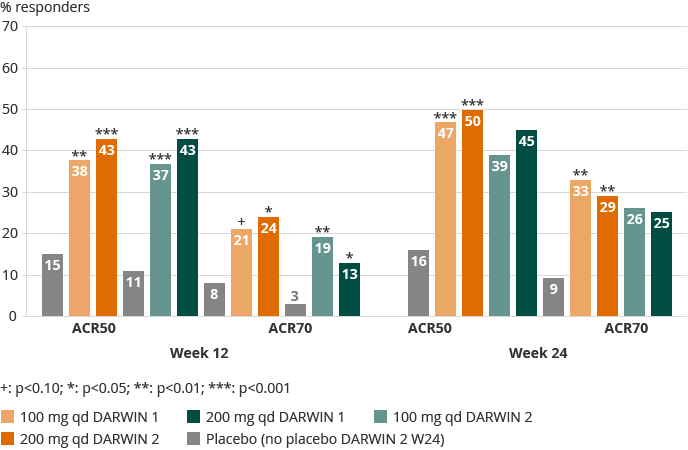 In DARWIN 2 a higher discontinuation rate for safety was observed for placebo (5.6%) during the first 12 weeks of the trial compared to filgotinib treated patients (2.5%) up to week 24. Similar incidence of serious and non-serious treatment-emergent adverse events was reported, evenly spread over the dose groups including placebo. A higher rate of infections was observed in filgotinib (19% over 24 weeks) compared to placebo (10% up to week 12), with serious infections remaining limited (1.4% of filgotinib patients). No malignancies, tuberculosis, major adverse cardiac events, opportunistic infections, or deaths were reported in DARWIN 2. On the basis of pre-clinical findings, males in the U.S. were restricted by the FDA to the 100 mg dose for DARWIN 1 and 2. Male reproductive hormones consequently were monitored in male patients taking 200 mg in DARWIN 1 and 2 outside the U.S. No clinically significant changes or discontinuations were observed for male reproductive hormones in either trial. Consistent with its selective JAK1 inhibition, filgotinib treatment led to an improvement in hemoglobin (DARWIN 1 up to 0.5 g/dL, or a 4% increase from baseline, DARWIN 2 up to 0.4 g/dL, or 3.6% increase from baseline). In DARWIN 1, all lipid fractions including HDL and LDL increased, with the largest percentage increase in HDL, while in DARWIN 2 similar increases in LDL and HDL were maintained. Neutrophil levels remained stable after initial decline to mid-normal range at week four. Neither lymphocytes nor liver enzymes were impacted by treatment with filgotinib in either study. Note: data from separate RA studies not conducted by the Company. filgotinib – Westhovens et al, and Kavanaugh et al, ARD 2016; baricitinib – Dougados et al, Annrheumdis 2016, RA-BUILD; tofacitinib – FDA AdComm briefing document May 2012; upadacitinib – Genovese et al A&R 2016 BALANCE 2. Note: data from separate RA studies not conducted by the Company. filgotinib – Westhovens et al, and Kavanaugh et al, ARD 2016; baricitinib – *Dougados et al, Annrheumdis 2016, RA-BUILD and Tanaka EULAR 2016 abstract RA-BEAM; tofacitinib – Van Vollenhoven abstract 2013, ** median CFB at W6; upadacitinib – Genovese et al A&R 2016 BALANCE 2. Of the patients who have completed DARWIN 1 and DARWIN 2 and were eligible to continue, approximately 98% elected to participate in the DARWIN 3 follow-up trial. DARWIN 3 is a multi-center, open-label, long-term follow-up safety and efficacy trial of subjects who have completed either DARWIN 1 or DARWIN 2. All subjects have started the trial at the same dose level, either at 200 mg once per day or at 100 mg twice per day (except for males in the U.S. sites of these trials who receive a maximum daily dose of 100 mg), depending on the regimen administered during the preceding trial, with DARWIN 1 subjects continuing to use filgotinib in combination with MTX. FINCH 1 is a 52-week, randomized, placebo- and adalimumab-controlled trial in combination with methotrexate (MTX) in an expected 1,650 patients who have had inadequate response to MTX. The primary endpoint is ACR20 at week 12. The study will also include radiographic assessment at weeks 24 and 52. FINCH 2 is a 24-week, randomized, placebo-controlled trial in an expected 423 patients who are on conventional disease-modifying anti-rheumatic drugs (cDMARD), and have had an inadequate response to biological treatment. The primary endpoint is ACR20 at week 12. FINCH 3 is a 52-week, randomized trial in an expected 1,200 MTX-naïve patients to study filgotinib in combination with MTX, as well as monotherapy. The primary endpoint is ACR20 at week 24. Radiographic progression will also be assessed. Gilead will perform a single dedicated male patient safety study concurrent to all Phase 3 programs. This study is expected to include RA, CD, and UC patients.